I have a knit dishcloth pattern. There is no multiple given, just a number to cast on 41 stitches. I want to make a shawl out of this pattern, how do I do this?? I need about 64 stitches or so. Since I don't know the multiples to use for this and not wanting to mess up the pattern, how do I do this? 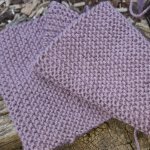 Answering your question would be so much easier if you have included the row instructions for the stitch pattern you want to use. As it is, you have told me what you want to do, described the problem that is preventing you from doing it, but you have not given me the information I would need to work it out for you. Most stitch patterns have a couple of components to the instructions for each row, and it is usually possible to work out what the repeat is by doing a little simple stitch counting. Seeing as you didn't provide me with one or more of the row instructions from the dishcloth pattern, I can't do it for you but I can show you an example of what I mean and hopefully that will help you to work it out for yourself. K7(8), p8, *k13(15), p8, rep from * to the last 7(8) sts, knit to end. Look for the * in your dishcloth pattern. If you have one then all you have to do is to count the number of stitches between the * and rep. In this case it is 21(23) sts. This is the repeat. Some patterns need 1 or more stitches at the beginning or end of each row either because the total number of stitches does not divide equally by the number of stitches in each repeat (i.e. there are extra stitches left over), or because the repeat begins with a YON or similar. As you are making a shawl, providing you can work out the number of stitches in the repeat, you can probably adjust the number of stitches you cast on to suit.